A contribution from WightAID has allowed all Isle of Wight Girlguides to benefit from the production of new Programme Booklets. 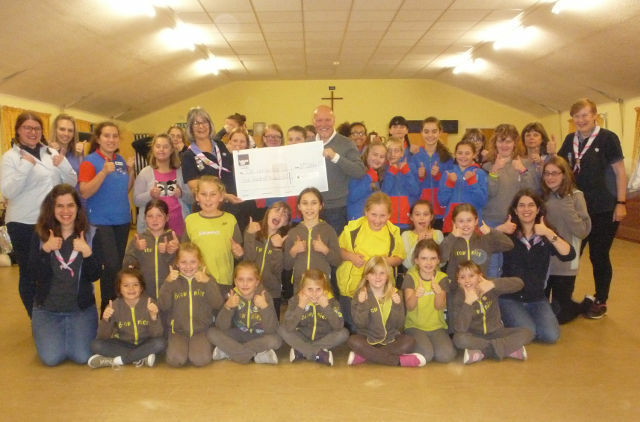 Girlguiding Isle of Wight has been presented with a cheque for £500 by WightAID. This presentation was made to members of Girlguiding IW by Brian Marriott a Trustee of WightAID during a Brownie, Guide and Ranger meeting. Since its formation, some eighteen months ago, WightAID has granted some £200,000 to over 60 groups and charities with support coming from local businesses. It is a way that Island businesses can support local charities which in turn benefits the Island’s community. All Girlguiding members on the Island will benefit from the donated money as it will be spent on New Programme books. This will enable all the girls and young women to access the New Programme which has recently been introduced. Themes will run all the way through the New Programme from Rainbows age five right up to the new 14–18 Ranger section. Know myself – Girls getting to know who they are, and their role in Girlguiding and the wider world. Express myself – Girls showing off their creative side. Be well – Physical and mental well-being for girls. Helping girls look after themselves and others. Have adventures – Girls exploring the outdoors and nature. Take action – Empowering girls to make a difference and use their voice to help their local community and the wider world. Skills for my future – Providing the building blocks for girls to become independent and successful in life. Brian Marriott was thanked for attending the presentation and WightAID were thanked for the donation. “It is great that WightAID has donated £500 to Girlguiding IW. All the Girlguiding units on the Island will benefit from this with the purchase of New Programme books.